An interesting theory from the article: "Italian news agency ANSA said authorities suspected that a structural weakness caused the collapse". Structural weakness versus structural instability is a meaningful distinction. Don't know if they're right here. Was it a cable-stayed bridge? The video seems to show a tower collapsing. 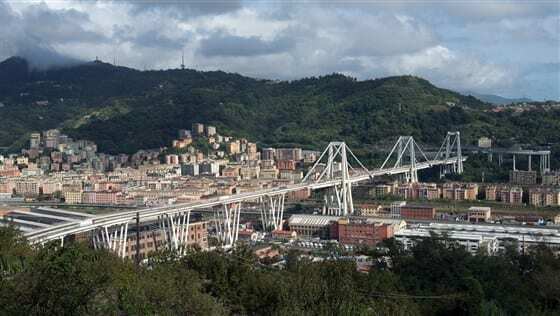 On 14 August 2018, a 200-metre (660 ft) part of the Ponte Morandi crossing the Polcevera stream and an industrial area of ​​Sampierdarena (a major port and industrial area of Genoa in northwest Italy) collapsed during a torrential rain storm. Approximately ten vehicles were reported to have been on the collapsed span. The initial hypothesis formulated is that of a structural failure. 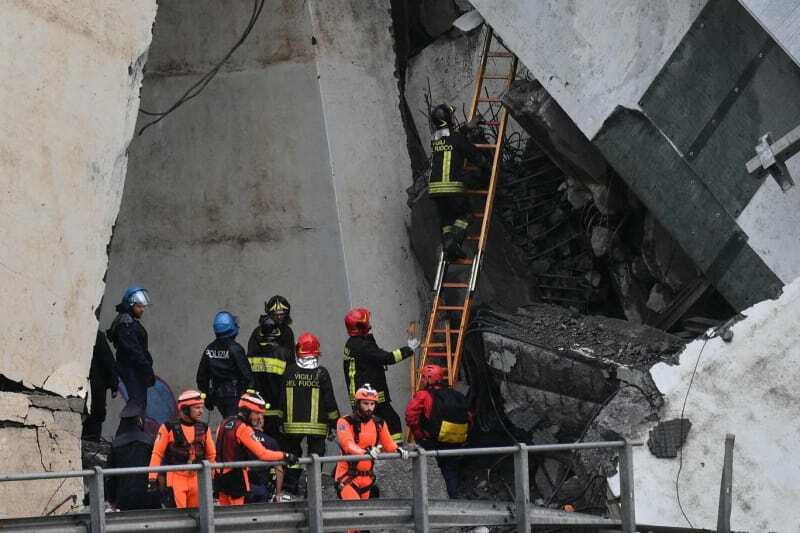 Dozens of people are reported to have been killed in the collapse; at least 35 deaths have been confirmed so far. A large part of the collapsed bridge and the vehicles on it fell into the flooded Polcevera, while other fragments landed on top of railway tracks and warehouses. The bridge was reportedly undergoing maintenance at the time of the collapse. 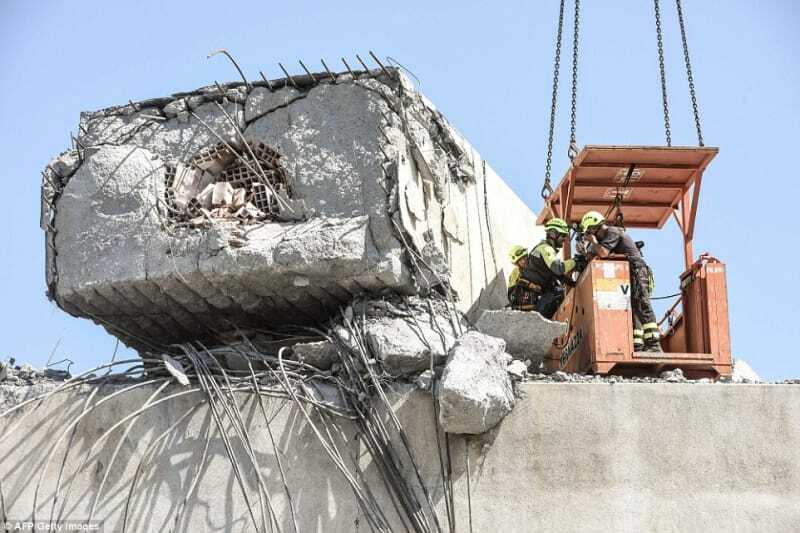 "The highway operator said work to shore up the foundation of the bridge was being carried out at the time of the collapse, adding that the bridge was constantly monitored. According to a source, "work was underway to consolidate the viaduct slab and, as planned, a bridge crane had been installed to allow maintenance activities to take place". "Restructuring work on the bridge was carried out in 2016." If it's the Autostrada del Fiori it's a cable stayed bridge with A frame towers. "...a rare type of cable stayed bridge that uses prestressed concrete stays instead of conventional wire strand stays. Morandi developed this unique type of stay as an extension of his skill with concrete and how it could be used in unusual ways." Looks like the west tower collapsed which seems to be beside a floodway. 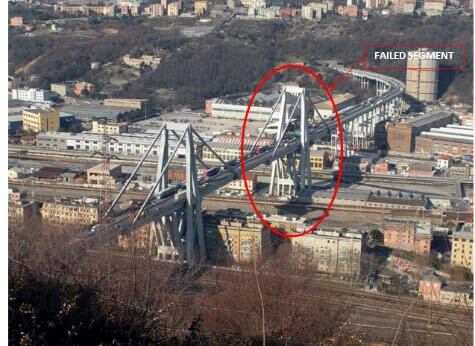 It's interesting how isolated the failure was - not cascade failure to the other segments of the bridge. 3DDave, the bridge probably has expansion joints isolating the portion of deck supported by each tower, and the approaches. Built in 1967, if the design was a contributor to the collapse, so certainly was in part due to the maintenance work. The original cited article now says 22 confirmed dead. 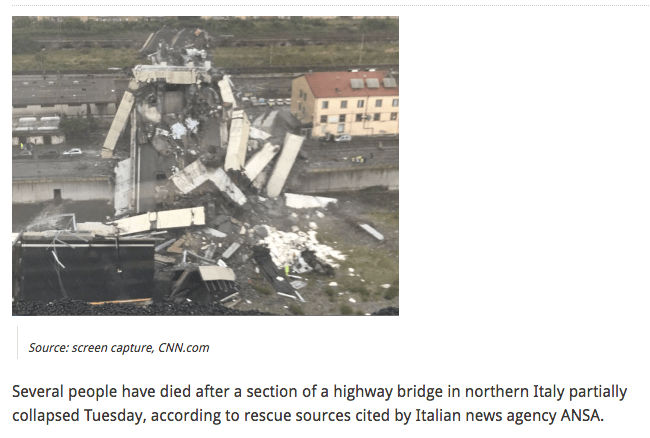 "...after a section of a highway bridge in northern Italy partially collapsed Tuesday,..."
And they can't claim that they were saying that only part of the bridge had collapsed since they had already qualified their claim by saying that "a section of a highway bridge". Just poor reporting or poor editing, take your pick. Poor wording, it happens. Reminds me of overuse of "alleged". "Structural weakness" sounds like overly obvious wording, but then again, that meant they weren't suspecting sabotage or terrorism, it didn't get hit by a plane or a ship, etc. "The initial hypothesis formulated is that of a structural failure." Uh yeah...that would be a given, wouldn't it, unless something big hit it, which no one has suggested? 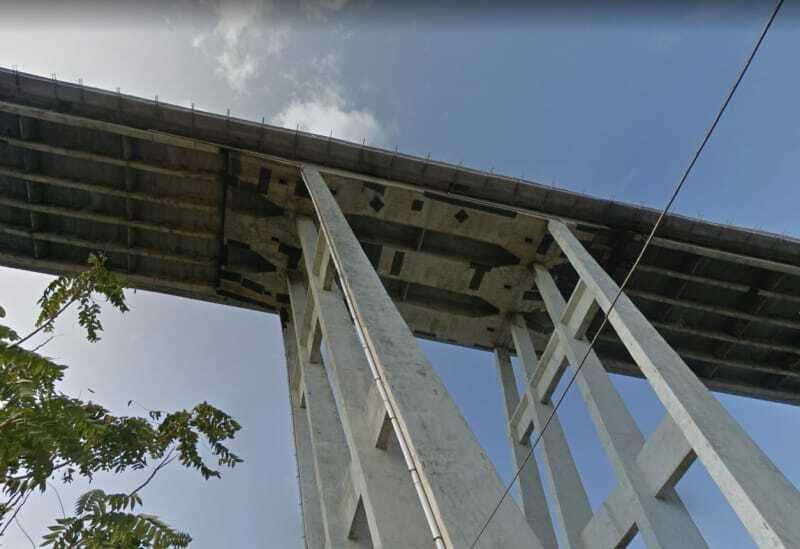 Interestingly, if you go to Google street view and ride across the bridge, the S/E span has external P/T strengthening up the length of all four concrete stays. The other main spans do not including the one that collapsed. There was work going on the north side at the deck level, but it looks like barrier rail work so may be unrelated. On one report I heard on the radio, there was mention that this bridge has been a problem pretty much since it was built. 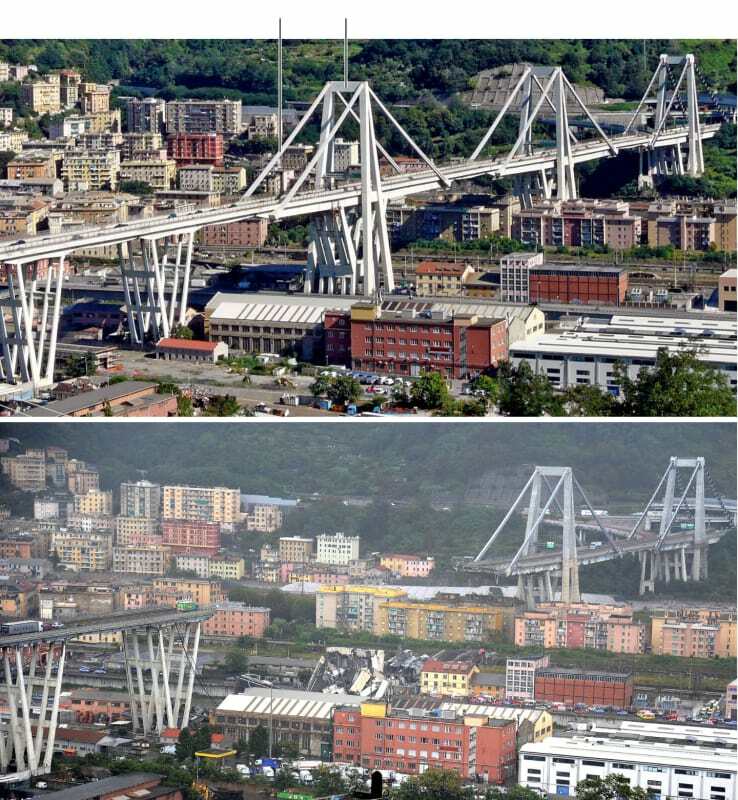 Also mentioned in that report was that about 30 bridges collapse in Italy EVERY YEAR. Of course, many are small and unremarkable, but still. 2 to 3 bridges per month? I don't think the cable-stayed part of this bridge fell down - it was the first pier beyond the end of the cable stays that appears to have failed - or the deck just adjacent to that pier. From the photo posted by bimr above, the two cable-stay assemblies are still standing. JAE, there were originally 3 towers, according to the pictures I have seen. One of them fell. Of course, It could have been a number of failures not associated with that tower. Preliminary reports say there was 'shoring' being done, and a tower crane was employed for maintenance work, but I haven't seen any evidence of a crane yet. My heart and prayers go out to the victims. This is the third deadly collapse in which maintenance on a bridge, open to traffic was a factor: twin cites interstate, FIU pedestrian, and this. The video shows one of the tower structures collapsing after the roadway. I haven't been able to see how many of the non-cable stayed segments of the viaduct collapsed (edit: apparently none.). "From the photo posted by bimr above, the two cable-stay assemblies are still standing." Two of them are, but there were 3 stayed spans (see the Google streetviews posted by cooperDBM). I think you're on the right track, though, because the video appears to show the tower collapsing (or being pulled down) after the deck had already come down. 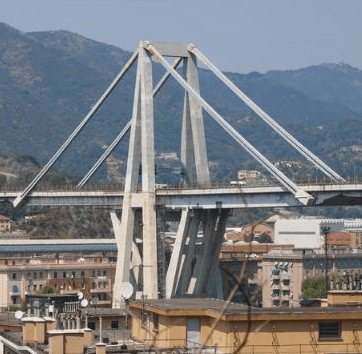 A structural engineer who lectures at Genoa University, Antonio Brencich, warned back in 2016 that there were problems with the bridge, Italian media report. It was inaugurated in 1967. "Right away the bridge manifested various problems, beyond the construction costs, which went over budget," he wrote in 2016. "There are errors in this bridge. Sooner or later it will have to be replaced. I don't know when," he warned. The Italian site ingegneri.info quotes his warning in full. In the 1990s some major repairs were done to the bridge. Mr Brencich said the designer, Riccardo Morandi, had miscalculated the "viscous deformation" - an ageing effect on reinforced concrete. "He was an engineer with great insight but lacking in practical calculations." thebard3 and HotRod10 - yes you are correct - I should have looked closer at the photos. "viscous deformation" is apparently the same concept as concrete creep? thebard3: "The link is Italian language for anyone who can read it"
It may explain why the cables are flanked on the "concrete stays" of the NW tower. A different article said concrete stays are a unique feature, but I don't understand the point of doing it (so the cables would be stretched? to stop them from rusting?). Seems the concrete would just add a lot of weight. Has anyone heard what was done for "restructuring" in 2016? JAE's pictures from the bottom side of the bridge and others show what look like patches or some type of laminate covering parts of the concrete. Can one of the structural guys make sense of these? I think they are patches to trap spalling concrete and keep it from killing or injuring people beneath the bridge. Similar structures with larger weave is used along some steep rocky highways to catch rocks from rolling onto the road. This is an article from the Italian Wikipedia. When I view it in Chrome, Google offers to translate the page. If it doesn't, try right clicking on the page and look for "translate to English"
One photo shows a building with the cornice notched to provide clearance; maybe an inch or so. I'm thinking the obvious happened and one of the stays failed - either in the stay or, more likely, at the upper attachment, causing the deck on that side to twist and fall, which then overloaded the other stay on that deck segment. Since the main span could not survive as a cantilever it fell, the unbalanced load cause the upward V to tilt and fail, dragging with it the other span. The finale was the stays on that side pulling the tower down. Because of the asymmetry of the initial failure the failure of the far side was also a bit asymmetric. It's possible the stay was already compromised enough that a lightning strike was the last straw, though the additional wind load might also have done the trick. Or maybe a rust fragment finally grew a bit too large. The stays for the spans over the inhabited/apartment areas had already been reinforced with bolt-on steel, and the failed section had it's upper stay ends reinforced with external steel plate. It's clear that someone thought that the stays had a high risk of failure. I'm still wondering if the pier was partly undermined by the floodway beside it - enough to cause a tilt and overstress. Seems there was a severe storm and judging from the video I posted earlier the floodway can fill up. Many bridge have come down that way. Some relief that the span over the apartment blocks didn't come down. "I think they are patches to trap spalling concrete and keep it from killing or injuring people beneath the bridge." The necessity of adding something to catch chunks of concrete that break off is never a good sign. It brings to mind the bumper sticker I've seen on a few old trucks that reads "Warning: Parts may fall off". Don't look at the underside of Missouri bridges. MoDOT and city street crews dump salt by the ton and it corrodes the steel mesh, punching chunks up to 2 foot in diameter and about 1 inch thick loose. I think the maintenance technique is to rap any place with rusticles and salt stalactites with a hammer until the area pops loose, but they still do drop randomly by themselves. However, this bridge deck is more than 100 feet high and the outcome isn't going to be a dented roof or broken windshield. The Gardiner Expressway in Toronto has had a few chunks of concrete break off and fall on the roadway below over the years. It's nowhere near as high as the Genoa bridge. In the absence of evidence or video of the actual collapse, I agree with 3DDave at this point and think the non redundant concrete & steel stays must be major suspect especially given the repairs undertaken on part so them before. The split in the stays before they attach to the deck look interesting. However any tilt of the tower could detach one of the connecting slabs and then it all gets very unbalanced. Creep and shrinkage can cause a major loss of prestress. Underestimation of multi-decade creep has caused excessive deflections, often with cracking, in many of large-span prestressed segmentally erected box girder bridges (over 60 cases documented). Creep may cause excessive stress and cracking in cable-stayed or arch bridges, and roof shells. Nonuniformity of creep and shrinkage, caused by differences in the histories of pore humidity and temperature, age and concrete type in various parts of a structures may lead to cracking. So may interactions with masonry or with steel parts, as in cable-stayed bridges and composite steel-concrete girders. Differences in column shortenings are of particular concern for very tall buildings. In slender structures, creep may cause collapse due to long-time instability. I can't find any photos suggesting any additional external reinforcing to saddle region of the Western tower that collapsed. Certainly none in the Google Streetview of 2017. * The most eastern tower stays have been girdled and surrounded by cables that appear to have enough material to entirely replace the original stays. * The middle tower stays have supplemental steel girdles at their upper ends, possibly to reinforce their attachments to the tower. * The western tower and stays, which were involved in the collapse, appear to have none of the reinforcements applied at the middle or eastern towers. * The reinforcements applied at the other towers worked, making the unreinforced tower the weakest link. * Officials underestimated the deterioration of the western tower and stays, and so failed to apply any of the reinforcements to it. Of course, it is quite possible that other factors such as instability at the tower foundation dominated the collapse, and that the reinforcements were irrelevant. One other thing, the lightning strike shown in the one video of the collapse appears to have occurred after the collapse was well underway and the eastern portions of the western span had already fallen. However, it might be worth considering that an earlier strike (lightning often does strike twice! ), not captured on video, might have sent enough amperage down the cables to put them over the edge. I don't think it's likely, but it's among myriad things that will have to be considered. Good links - there is spall capture material applied at the top of the stays at the western tower. Perhaps there was cracking leading to water infiltration leading to excessive corrosion of the internal cables. This article talks about corruption in construction (almost halfway down). Has a lot of photos.. updated today with a lot of victims. 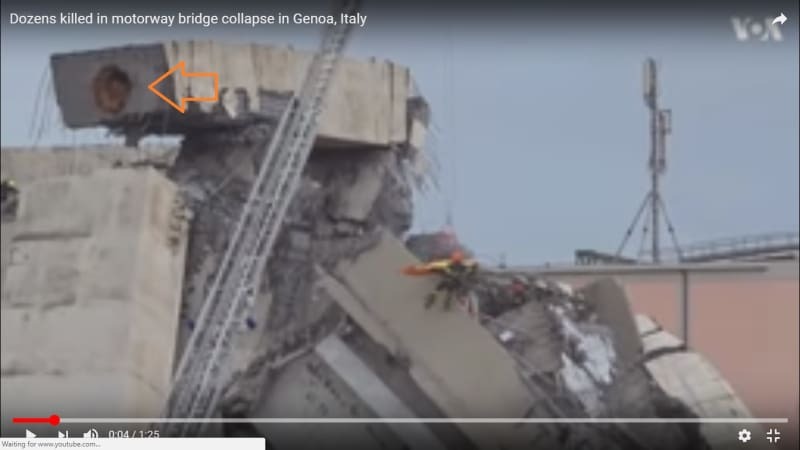 "There were also concerns the Italian mafia could have contributed to the bridge's collapse by their construction companies being involved in maintenance work - including shoring up the foundations. 'Mafia-related companies are known to have infiltrated the cement and reconstruction industries over the decades and prosecutors have accused them of doing shoddy work that cannot withstand high stress,' Canada's Globe and Mail wrote." Could be work at the top of next section saved that portion from falling on the apartments. I can imagine on balcony seeing that fall. The above article said it was reported two people died in their home. The more pictures and stories to come from this tragedy, the more I see that this bridge seems to be, uh, dilapidated. Repair and reinforcement work was started in the '90s and was never completed, and the section that fell seems to be the section that received the least of this repair and reinforcement work. 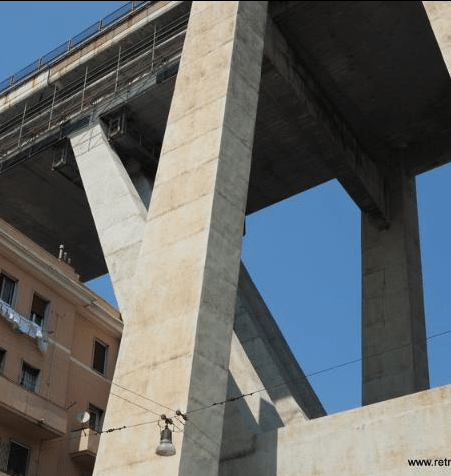 translated "I problemi dello “schema Morandi” e quel precedente del 1964"
Rome - After the tragedy that took place on the Morandi bridge in Genoa, Antonio Occhiuzzi, director of the Institute of Construction Technology of the National Research Council, recalled that the prefabricated reinforced stays made of other viaducts that are similar (like in Maracaibo, in Venezuela, but also in Basilicata), have shown a relatively reduced durability. And the stability of a bridge of this type depends fundamentally on the behavior and the condition of the stays. 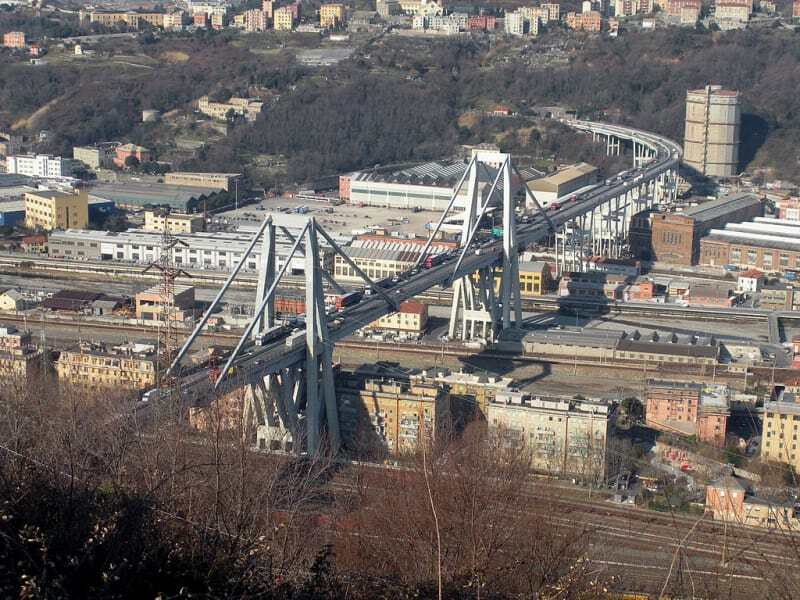 In the case of the Genoa bridge, Occhiuzzi noted, some of the stays have been modified with clearly visible reinforcement, but the collapsed section was not modified. It is necessary to understand the background of the decision to reinforce some stays, but the same treatments have not been carried out on the other stays that are similar. 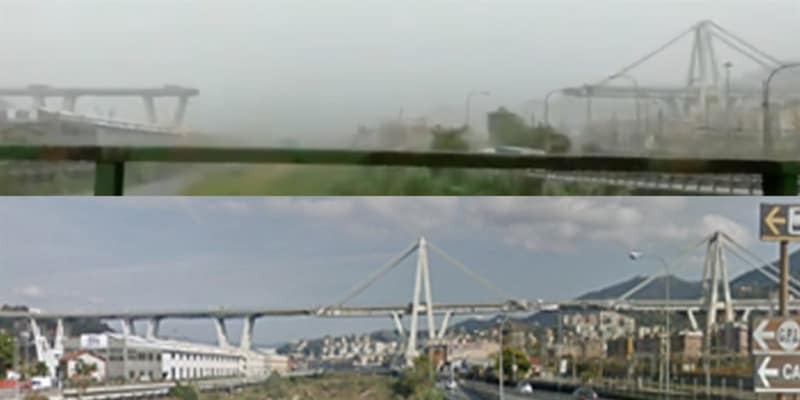 Then Occhiuzzi recalled the previous failure of road infrastructures: "In July 2014 a spill of the Petrulla viaduct collapsed, on the state road 626 between Ravanusa and Licata (in the province of Agrigento), breaking in half due to the crisis of the pre-compression system; in October 2016 a flyover in Annone (Lecco) collapsed due to an exceptional load that was incompatible with the strength of the structure, which however was very aged compared to the original capacity; in March 2017 an overpass of the Adriatic motorway collapsed, but due to an accidental event during maintenance work; in April 2017 a span of the tangenziale di Fossano (Cuneo) collapsed, breaking in half in the absence of vehicles in transit and with methods very similar to those of the Petrulla viaduct". 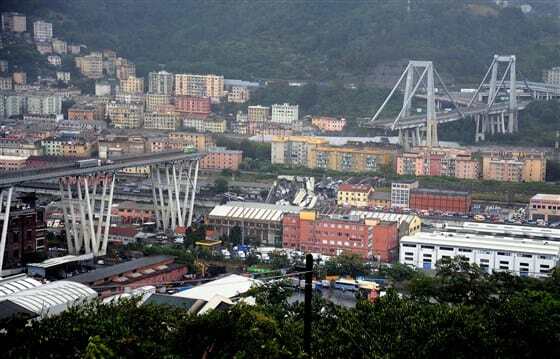 A twin bridge of the one that collapsed in Genoa was constructed in Venezuela in 1964. This bridge was later was struck by an out-of-control tanker: That bridge was the General Rafael Urdaneta bridge over the 8.7-kilometer-long bay of Maracaibo, with 135 spans, of which there are 6 towers built with the same cable stayed scheme used by the designer Riccardo Morandi in Genoa. It was April 1964 when the oil tanker Exxon Maracaibo, from 36 thousand tons, due to an electrical failure lost control at the exit from the Maracaibo lagoon and ended up against the 30 and 31 piers of the bridge, more than 600 meters away from the bays designed for the passage of naval traffic, with such violence that made them completely collapse, dragging into the sea 3 consecutive bays of the bridge. This type of event had not been taken into consideration during the design. Professor Andrea Del Grosso also spoke on the same issue, for years he was a professor of construction techniques at the University of Genoa, and today he teaches a course on Infrastructure Management and Monitoring: "Morandi has always had problems with corrosion on the stays and of excessive deformation, due to the loss of tension of the steel cables inside the prestressed concrete structures. But at the time of construction the deformations of the concrete were not known as today. We have been studying the problem of the degradation of these structures only for twenty years ". Antonio Brenchich, said in a video interview, the possible cause was the stress corrosion; due to high preload of the stay bolts (he said 1500-1600 MPa and also up to 1700 MPa (15-16 kkg/cm2 he said), (so high?) this means the bolts reach the yielding point for sure. Or maybe he meant only 150-160 MPa insyead (but that seems too low to me)?). The corrosion in preloaded bolts is accelerated so the ageing is faster. Then he said the rupture is brittle because of the bolt being under this high tension load (this seems strange to me, the steel shall not change its stress-deformation characteristic, just because it is under tension; maybe I did not understand and it is true for all the coupling of concrete under compression and steel bolt under tension togethere). Here is the interview, at min. 2:14. Stress corrosion cracking (SCC) was a big concern at the nuclear plants I've worked at. I don't know much about it, but I always heard that term being floated around in meetings. Link Might be what Mr. Brenchich was referring to. SFCharlie - The voids in the photos are in the columns of the towers. It looks as though they were made using cardboard void forms. The voids are to prevent the heat of cement hydration (exotherm) from causing subsequent stress in the mass concrete from shrinkage and other ill effects. You're a structural guy. 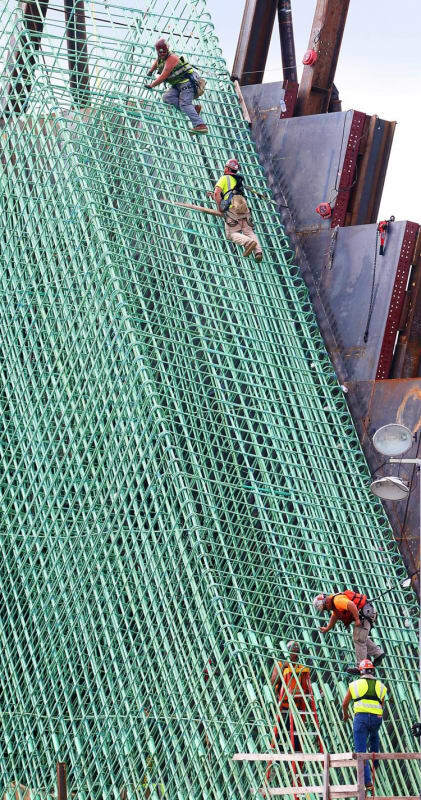 That doesn't look like much rebar in that tower, in fact I only see a layer just beneath the peripheral surface. I don't think that would make the grade today, would it? I have been wondering about the apparent skimpy re-bar also. Referring to the picture posted by epoxybot, is it normal for a single layer of re-bar to be positioned that close to the surface? Thank you epoxybot. Nice photo. thebard3 - My knowledge of structures is from a manufacturer/supplier career in the Concrete Forming, Repair, Materials & Sub-Contracting side with a strong emphasis on structural repair - namely epoxy and other polymers. When I first registered many years ago I wasn't sure what category I should list. Last time I checked there isn't really an "Associate" category. I don't disagree, that the column looks "Basic". My knowledge of Mass Concrete comes largely from reading the Bureau of Reclamation's "Concrete Manual". Certainly by today's standards this would be considered "Under Nourished". What also stood out to my eye was the shape of cleavage plane. I would have expected more of a fractured surface. The photo I posted is suggestive of a cold joint region and the rather smooth, almost chalky break raises concerns of carbonation of the cement. Cant comment on the amount of reinforcement, but concrete cover of steel reinforcement can vary between 1 and 3 inches. I dont know know Euro-codes of from the 1960's. But I would guess its in that range. 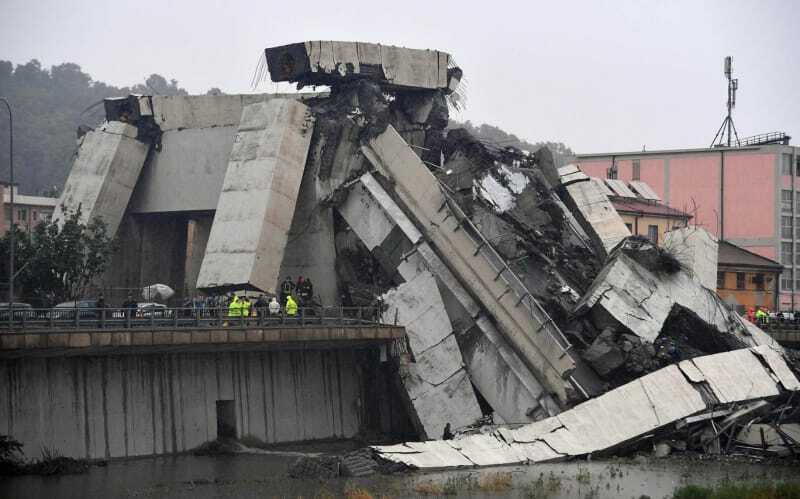 "Stays on the eastern span of the bridge had been remade, with huge costs," said Royer Carfagni, the Parma University lecturer, "But it was thought that the problem was not critical on the western span, which is the one that collapsed." Does anyone know why the east span stays were rebuilt, or why the reinforcement metal was installed at the top of the center span stays? The remade the concrete coating only of the stays, because it was corroded and aged, I suppose. My observations are that the stays at the east tower are completely different now from the original. Large steel reinforcements have been added to the top of the tower and additional cables surround the original stay (or stralli?). None of these modifications were made to the west tower that collapsed. We're professionals here, let's try to keep the speculation under control. As we saw in the FIU collapse, sometimes members of the public or press tend to wander in here and take the opinions offered as engineering fact. As for the reinforcing, yes, it was and is common in piers of this size to have reinforcing only around the perimeter. After all, that is where the steel is most efficient. A failure surface like the one shown above is an indicator of a sudden failure, rather than one that developed slowly over time (which would be rougher or more "fractured"). As such, it is most likely that the column failure was a result of some other issue, rather than the root cause. "As such, it is most likely that the column failure was a result of some other issue, rather than the root cause." Most likely a result of the large moments generated by failure of other components, which the column was not designed or expected to carry. I recall seeing a while back an article on why Roman concrete was so long-lasting, but don't recall the details. Also, keep in mind that structurally, things tend to fall into a pile, and the closer your structure is to a pile in the first place, the longer it's going to last. So a pyramid is a big square pile, and it's there for the duration. Burial mounds here and there are still around. Structures that are basically heavy things stacked up- they're good if the earthquake isn't too strong. Other things- not so much. Roman structures 2000 yrs old that are still standing have generally required, and received, a decent amount of caretaking and maintenance/repairs in order to do so. That said, those structures were built before the era of steel reinforcement. Concrete is not fully impervious to water and air, and steel is quite obviously not resistant to corrosion if there is water and oxygen around. Therefore, anything made of steel-reinforced concrete in a climate that is not bone-dry has a clock slowly ticking away to its eventual failure. I also recall reading that the volcanic ash that was part of the Roman concrete mixture had something to do with its durability. This is from google map. The west tower which collapsed was not properly reinforced so far as I understood. My text got cut off. Article on a study to look at the stays. So, they had already retrofitted the east span stays, had a report stating there was an "anomaly" in the subject span, and were working on a fix of some sort apparently. This is looking FIUish to some extent. They may have utilized geopolymeric cements. I think the failure to avoid this collapse was a result of knowing the exact problem source, but not the extent, and therefore not understanding the time frame needed to perform the repair. The FIU situation seems like no one understood the fundamental problem and the attempted fix made it worse. Given the extent of spalling in the FIU bridge it's surprising they could get any workers on the bridge. 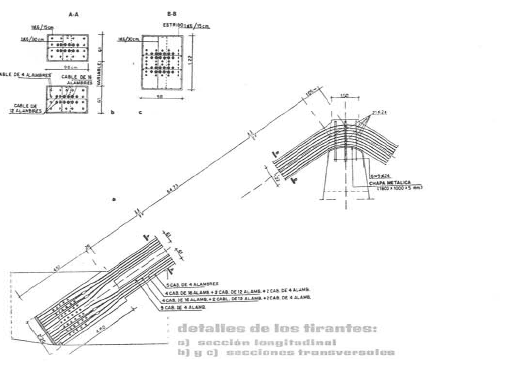 The FIU failure seems very similar to the project management failure described in the 1907 Quebec Bridge failure where structural members were not behaving as expected but work progressed anyway. https://www.thecanadianencyclopedia.ca/en/article/... Other articles said a number of bridge workers had stopped showing up as the extent of the deformations increased. 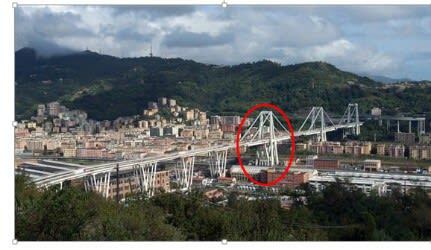 It looks like it was well known that the Genoa bridges had a problem and it looks to me that the focus on repairs was to fix the parts that potentially endangered the most lives first. I note the study head did not call for the immediate closure based on the results, just for further study. And that the bridge authority had already started the process of getting funding to make repairs on the now-failed span. It is ironic that the Romans had some particularly disastrous failures too, like the Fidenae Amphitheatre. Perhaps one of the most shocking is the Fidenae Amphitheatre collapse, the earliest and the worst structural disaster in history. In 27 AD, according to Tacitus who provided the most accurate account of the event, “50,000 men were maimed or crushed in that disaster”. Let's face it. Modern engineering knowledge allows an engineer to design and analyze to a great deal of accuracy and confidence. The Romans were good engineers, but didn't have the in-depth knowledge we have today. The Romans either seriously overbuilt (the Pantheon), adequately built (most structures) or under built (Fidenae Amphitheater example above). The Roman examples that are still around today technically by today's standards are failures - because they were overbuilt. Economics and accountants today would not permit such projects. Your definition of "overbuilt" differs from mine. That big concrete dome is completely unreinforced. That would be considered inadequate today. Root cause analysis should identify one, and one cause only, why the structure failed. 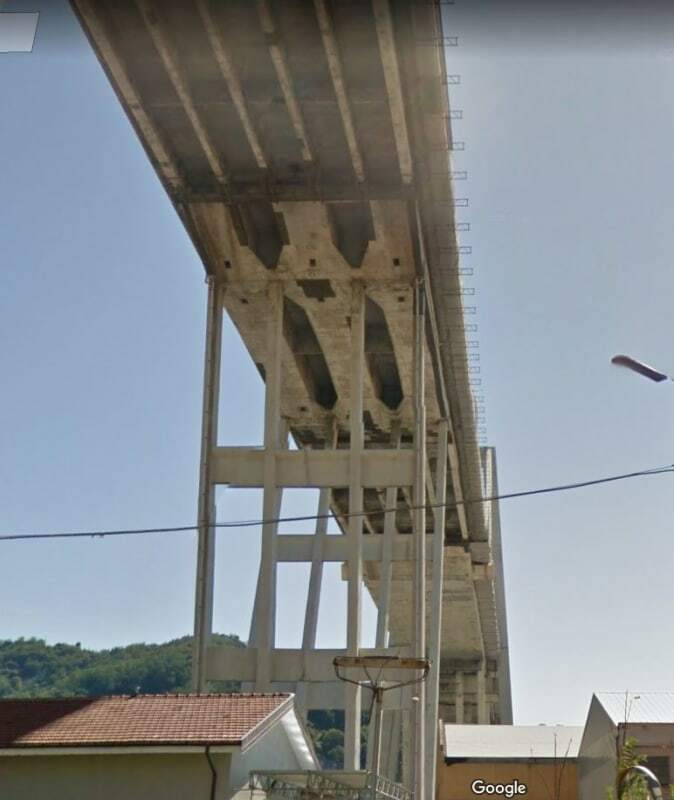 When the media say "the bridge was 50 years old, it was not designed for heavy traffic, the maintenance was poor, and it was raining heavily that night, plus some guys were digging around the foundations" - that is all kind of fruit lumped together and it actually hides the principal cause. Which is what we all are interested in. One of the very first programming lessons I learned in 1965 was that if I found a bug in one part of a program, was to look for the same bug everywhere else in the program. 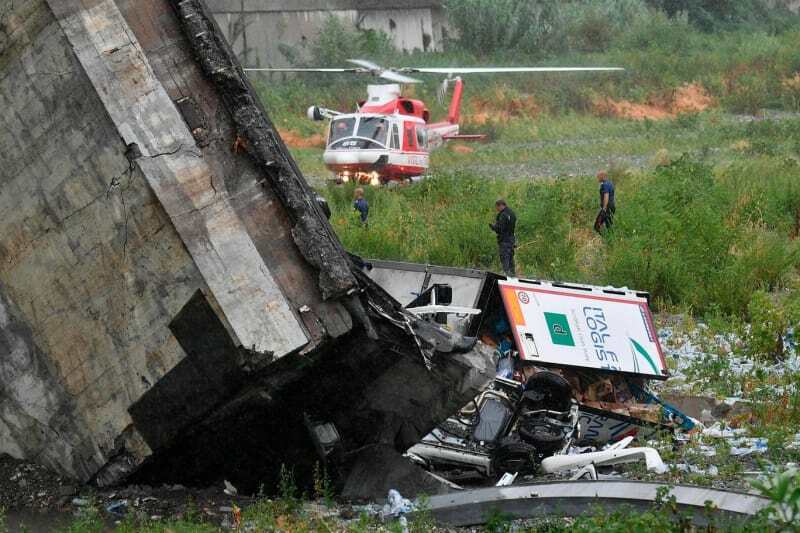 So does Italy have any type of government agency that reviews collapses like this similar to the NTSB in the USA? Just wondering if they ever publish reports as to "why it fell down"? JAE (Structural) - That is a good question. To Columbia's credit when investigating the Chirajara Stay-Cable Tower Collapse they did seek "private" international forensic help. Something more akin to Peer Review. So does Italy have any type of government agency ...?" yes, there is, but ...! In the agreement between the highway Co. and the Government Authority it is stated that a Gov. Agency is enforced to control the maintenance investigations of the highway Co., but recently (2 years ago, approx)the Gov. Authority charged the highway Co. to control the controlling team : the controlled people have to control themselves !! One needs to be careful in comparing different structures from different times; we don't know how many structures of old failed, we only see the ones that survived. Additionally, the level of overdesign, the investment, and consequences to the engineers are radically different. Good point. What do you think would happen to an engineer in Rome that designed a faulty structure? On the other hand, what should happen to an engineer that designs a faulty structure? Just because the Pantheon has stood for 2000 years doesn't mean it's an ideal structure. If something is truly deemed 'faulty' because it used questionable materials, designs, techniques and the like, then there should probably be some culpability. If it seemed like a good design at the time and failed due to unforeseen circumstance, then not so much. That question probably gets addressed as part of the FIU bridge collapse. There's also a big difference whether someone intentionally under-designs, as in the case of the Pinto, or simply doesn't know any better, as in the case of browser buffer overflow. I read a study once that tabulated compressive strengths for various samples from Roman concrete structures. I don't remember it being anything remarkable. Like nothing over 1500 or 2000 psi. As JStephen explained it, the survival of structures made with this concrete is a direct function of their resemblance to a pile. In structural engineering terminology this means: mass concrete designed to operate at very low stress levels and without steel reinforcement. 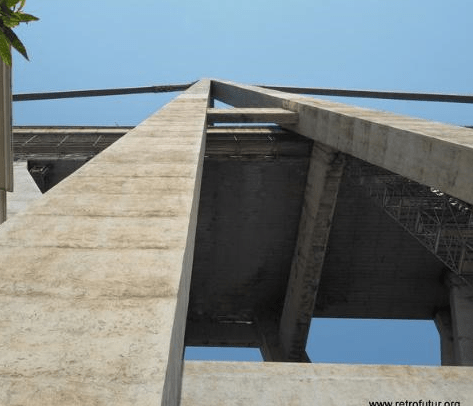 Concrete is exclusively or primarily in compression and has large effective safety factors against load cycles, instability, environmental effects, etc. Edit: The Pantheon is a bit of an exception since it has more slender elements and had to accommodate potentially large tensile hoop stresses. The tensile stresses do not develop because of thrust reactions provided by additional mass concrete. Furthermore this structure has obviously survived due to constant attention and retrofitting over the centuries. Actually the Pinto, if what I have heard is correct, was very safe, until the accountants started changing things. I also assume on the Pinto, an engineer signed off on the changes. The fact that no steel was used in Roman structures likely was why they lasted so long. Don't get me wrong, I like steel, but it has it's limitations, like causing foundations to explode when the steel is exposed to fault current. Ah, the Pinto. The Pinto's problem stemmed not from the fact that the fuel tank was in the same location as almost every North American car built at the time. The problem was that a Ford exec wrote a memo querying if this was a safe location for a gas tank. Also, the Pinto being a light front wheel drive vehicle, a car striking from the rear could more easily lift the rear of the Pinto and contact the gas tank. During the Pinto publicity years when any fire involving a Pinto was national news, there was a local wreck. A young lady was stopped in the left turn lane at a traffic light waiting for the light to change. A speeder could not stop a and to avoid hitting a string of cars, swerved into the turn lane and hit the young ladies car. He was breaking heavily and his car nosed under the other car and hit the gas tank. The young ladies body was identified from dental records. But, not a Pinto, no National news, only a small mention on an interior page of the local paper. Crown Victorias; Interestingly, if something hit a Crown Vic hard enough to lift the rear and impact the gas tank, the bolts on the back of the differential housing would often puncture the gas tank and a fire would often follow. It didn't happen that often because it takes a lot to lift the rear of a Crown Victoria. I understand that Crown Vics built as police interceptors had a hard plastic ring covering the bolt pattern on the back of the differential. Every car that I owned prior to and during the Pinto years had the gas tank in the same place, underneath and just ahead of the rear bumper. Trucks had the gas tank behind the seat. I drove a dump truck with a leak in the gas tank. I ran with the seat tank empty and made sure that I didn't run out on the saddle tank. There was no gauge on the saddle tank, normally when the saddle tank ran dry the seat tank was the come home supply. Common back then. PS I owned two Pintos. One was a station wagon bought new for my wife. The other was bought second hand and was still running when I gave it away to a student for a shop project with over 230,000 miles on the clock. One thing I noticed was that the hatch-back had somewhat of an aerodynamic profile and got very light in the back end at about 70 MPH. I used to like driving fast but not in the Pinto. The Pinto was supposedly missing a couple of bucks of hardware that would have made it substantially safer; that's what the accountants drove. The Pinto was rear wheel drive with a solid rear axle. There was a bracket that needed a cover plate to prevent can-opening the tank. As part of the engineering cost evaluation of every part the cover plate was rejected. Despite my misinformation the point that I was trying to make is brought up in the Popular Mechanics atricle. Don't forget this one: in the early 1970s, the gas tank on all pickups was INSIDE the cab, behind the seat. The rules changed, and all the manufacturers had to move the gas tank outside of the cab. GM decided that if you hung the gas tank under the body, OUTSIDE the frame rails, that would be a good place. Unless, of course, the truck got t-boned, in which case the gas tank was instantly ruptured. Maybe someone should start a Pinto thread. I'd tell stories about my sister's Vega. Where is GregLocock when we need him? He has quoted figures to the effect that the Ford Pinto was somewhat safer than average for a subcompact of the mid-seventies. In the classic Pinto accident, three girls were incinerated when they were rear-ended at high speed by a van with a reinforced front bumper. For over 20 years the standard location for the gas tank was behind the rear axle. What was different about the Pinto? 1. Someone wrote a memo questioning the safety of that location. 2. Ford conducted a cost analysis and decided that it was cheaper to "Let it Burn." 3. The memo and the cost analysis became public and became evidence in a court case. Root cause analysis should identify one, and one cause only, why the structure failed. As a career practitioner in metallurgical failure analysis, I have to disagree. For the simple component failures I investigate for chemical process industry and boilers it is indeed most often true, but I categorize this as a system failure, where a variety of technical experts are required for the investigation. I reserve the term 'forensic' for such complex system failures. If I want to get philosophical about failure analysis, I could ultimately ascribe every root cause as 'human factors', but that would trivialize the exercise. However I don't think it is being philosophical to think that in this tragic case the conclusion applies literally, where political machinations, public funds, and designer hubris are implicated. We need to let the investigators do their work, which will take some time and hopefully will not be compromised by the political blame game going on. You refer to the Chevy Vega-matic and it's twin, the Pontiac Dis-Astra? The Pinto was rear-wheel drive. It was constructed on the large car model shrunk down: body bolted on a weighty frame. Very heavy. An I am surprised to hear you reached 70mph in any finite amount of time. My 1973 Capri with the same 2.3L engine was completely gutless (though it got lots of looks). More Pinto talk... time for a diff thread for those who are interested. Yes! But the thread could run on for a very long time, unlike the car. Interesting simulations, but none accounted for the rotation of the one large portion of the bridge. I expect getting the connectivity between the sections and the strength of the sections just right is a problem. Still, they did show gross behaviors that were also found in the actual collapse indicating that overloading the bridge or having a cable fail is not a good thing. Don't forget there was a howling gale at the time which might not be easy to simulate. Cable failure looks like the best bet so far. Has there been any more information released? A howling gale isn't going to flip that much concrete without flipping all the concrete. It wasn't enough to blow the truck from the bridge or deflect any vehicles. I think the model overestimated the torsional strength of the bridge deck and underestimated the bending strength of the tower members. The article provided by robyengIT is very interesting, but also presents a little confusion in understanding the principles of the Morandi's design. The bridge is an early version of a cable-stayed structure, with unique concrete cable protection system, also serving as added component of stays, carrying part of the live and dead load and reducing vibrations and deflection. So, the A cables were original stays, stressed by the cantilever's DL and later, by the center span DL and LL on both cantilever and center spans. These were not subject to any stress relaxation, to the contrary - any extra sagging of the cantilever was the sign of deterioration/degradation of the stays, increased stresses in the tendons, and resulting elongation of the stays. The B cables were likely extended beyond the anchorage of the A cables, to be fully effective in participation of carrying the loads. Detailed drawings of the anchorage zones will be very helpful. The stressing of the concrete encasement was only serving as protective anti-crack countermeasure, and reported "relaxation" was the sign of elongation of the A and B strands due to corrosion section loss, cracking (hydrogen induced stress cracking) and/or combination of both. Wow, the level of detail in the diagrams is pretty amazing. Kind of a hijack, but one of the things that impresses me about the design is the use of diagonally-oriented rebar to increase the shear capacity in the area where the support struts react concentrated loads into the viaduct sections. I think if Denney Pate had seen these diagrams a year ago, we might have a lot less traffic here in the failures & disasters forum. Another thing that struck me about the photos in the article is that this bridge appears to embody at least some of the principles of accelerated bridge construction. They show construction going on over the tops of buildings and across a busy rail yard. Different in many ways than the YouTube videos posted above - they have both southern stays breaking simultaneously, and a more clear distinction in time between the falling of the roadway and the collapse of the tower. That seems more consistent with the security video that has been released. jasm - that video is behind their subscription wall correct? I saw it - no pay wall. It's more of a slide-show than video. I got it - I finally realized I had to scroll down. I liked the scroll down better than a video. Thank you jasm. Thanks, Jasm. That is a very well presented and well supported article. I am not a bridge engineer (although through my career I did work on some aspects of a few bridges that were much smaller and simpler than this one). From my inexperienced perspective I have a problem with it. The article says that the pair of southern stays broke simultaneously. Surely that is highly unlikely to happen to a pair of independent structural elements. If the NYT's "simulation" is correct with regard to the fact that these stays broke in or near their middles rather than at their tops (and that should have been fairly easy to ascertain from examination of the post-collapse pile of rubble), what was the mechanism by which the break in the one stay caused a nearly instantaneous corresponding break to occur in the other? The first break would tend to lessen the amount of force in the second stay, not increase it. I have my doubts about this also. I'm not sure that the designers of the video / slideshow, realize that the pier structure is actually two separate structures as far as I can tell. You have the two A frames which are held together with two concrete beams at the top and under, but not supporting, the road way. These then have the suspension stays at the top. The second structure within the footing of the A frames is a Y shaped support which actually holds up the deck in two locations centred on the A frame. See the pictures below. 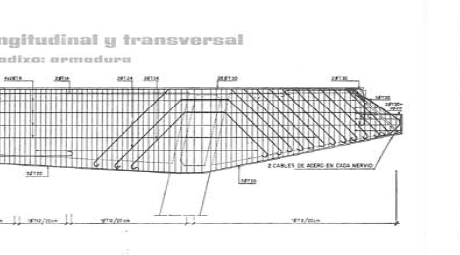 Thus when the slide show shows the bridge deck rotating, it would impact the horizontal support tieing the two A frames together which would probably start a collapse of the A frames. One failure of a stay could quite quickly lead to a second failure, but unless they both broke at the top, it seems unlikely they broke at exactly the same time. It would be interesting to see this apparently unreleased security video though. * The dashcam or phone video by a distant driver at the start of this also shows the delay. The roadway has already fallen and the driver is already shouting when the video starts. Then, the tower falls. As you can see on page 10 of the document posted above by robyengIT (31 Aug), the tendons are continuous over the top of the A frames, so breakage on one side, especially if near the top, where corrosion was likely deeper, implies immediate detachment of the other top end. Thanks, Prex. That would explain it. I was misled by the animation showing that both stays broke near their middles. So it would appear that the closer side loses both stays first, then the farther side is taken down by its stays, then the closer side falls down. The closer side in the video, however, is the nothern one, this would indicate that the stays that initiated the collapse were the northern ones, contrary to what is assumed in the beautiful article of the NYT posted by jasm. However the distinction between farther and closer side in the video is unclear, due to the blurred view, so the NYT might be correct. Observation of how the rubble of the A frames is scattered on the ground can easily resolve the issue. Had missed that drawing. I think any break anywhere in the top half of the stay above the split would be enough. I am no designer, but this design scheme doesn't pass the basic sanity test for me. What I do know is that I would immediately ban reinforced concrete for highway structures here in Canada. Road salt is a concrete-killer, and the structures are virtually uninspectable. There has to be more video. Supposedly there were CCTV cameras on the bridge. “I have heard that video footage from the CCTV cameras on the bridge just before the collapse showed concrete being exploded off the main stay because of the violence of some of the cables snapping underneath,” one source said. ironic, what you state is today a fact, but the bridge dates back in the sixties, when prestressed concrete was beloved and believed, by enthusiastic designers, to be light, elegant, and as durable as rock. True, but I think I would have considered it ugly both then and now. I haven't been in TO for a long time. How is the Gardiner holding up? How is the Gardiner holding up? With bandaids manufactured from dollar bills. I haven't been to TO for a long time, do not plan to visit TO for a long time, and hope not to travel to TO for a very long time. I hope I've made my feelings clear! Hey, I live in Ohio, so when I say that Gardiner expressway is pretty ugly, you can be assured I know what I'm talking about. It would fit right in any city here.